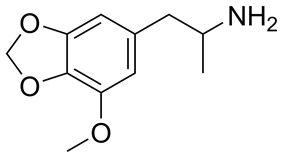 MMDA (3-methoxy-4,5-methylenedioxyamphetamine; 3-methoxy-MDA) is a psychedelic and entactogen drug of the amphetamine class. It is an analogue of lophophine, MDA, and MDMA, and also bears resemblance to the essential oil myristicin found in nutmeg. MMDA was described by Alexander Shulgin in his book PiHKAL. Shulgin lists the dosage range of MMDA as 100–250 mg. The first symptoms appear within 30–60 minutes following oral administration. MMDA produces euphoria and loving warmth, and attenuates feelings such as anxiety and loneliness. MMDA also produces eyes-closed visuals, a state of drowsiness, muscle relaxation, and time dilation. Side effects include moderate mydriasis, dizziness, sensations of heat or cold, and trembling. The imagery is generally realistic, and often related to everyday perception of people, landscapes, or objects. The effects of MMDA usually reach a peak during the first hour following the initial symptoms, and begin to wane during the second hour, and usually completely disappear by the end of the fifth hour. In his 1973 book, The Healing Journey, Claudio Naranjo explored the psychotherapeutic potential of MMDA. Like MDA, he found that MMDA facilitates communication and suggested it has potential applications in psychotherapy. Worldwide as of 2005, MMDA has not been approved for any human applications. MMDA has been shown to act as a non-neurotoxic serotonin releasing agent with no effects on dopamine release and probably norepinephrine release as well, and as a 5-HT2A receptor agonist. The latter property is responsible for its psychedelic effects, whereas the former mediates its mood-lifting and empathogenic effects. MMDA is classified as a Schedule 1 substance in the United States, and is similarly controlled in other parts of the world. Internationally, MMDA is a Schedule I drug under the Convention on Psychotropic Substances. ^ McKenna DJ, Guan XM, Shulgin AT (March 1991). "3,4-Methylenedioxyamphetamine (MDA) analogues exhibit differential effects on synaptosomal release of 3H-dopamine and 3H-5-hydroxytryptamine". Pharmacology, Biochemistry, and Behavior 38 (3): 505–12. ^ Zhang Z, An L, Hu W, Xiang Y (April 2007). "3D-QSAR study of hallucinogenic phenylalkylamines by using CoMFA approach". Journal of Computer-aided Molecular Design 21 (4): 145–53.